Australian engineering pioneer since the 1800’s, Munro Engineers introduces the Multi-Sett/ Tele-Sett post drivers with side shift. 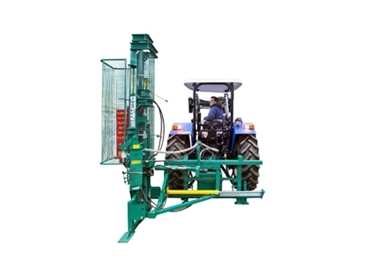 A flexible, fast solution to high capacity fencing work, these post drivers allow mounting of the Post Sett post drivers sideways with respect to the tractor. The tractor can then be driven straight along one side of the post line with the Post Sett retracted out of the way of posts and wires. Post Sett post drivers are moved hydraulically to their extended position completely clear of the tractor wheels for fast and accurate in-line setting. Once the posts have been set, the post drivers with side shift are quickly and safely retracted inside the wheel track of the tractor. Control for the side shift action is mounted on the Post Sett control panel. Thanks to the hydraulic design of the Posts Sett post drivers if a control lever is released the action it controls stops immediately. A series of guards also prevent operators from touching moving or dangerous parts of the post drivers during operation without compromising effective operation.